- UFO works only with the List view in Google Drive. - Google Photos is not supported as it doesn't allow the List view. - You can't use UFO with Google files such as Docs, Sheets and Slides. 1. In Google Drive, press the UFO extension button. If there are no files in your cache, the status of the UFO extension is displayed. A green check mark means UFO is active. The UFO button appears next to files that can be edited locally. 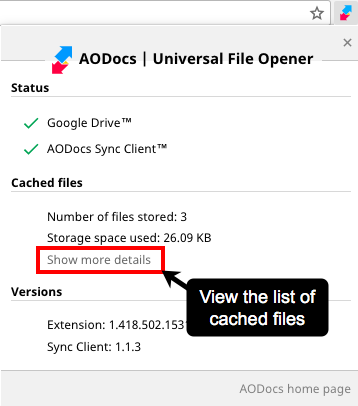 If you have one or more files in your cache, the list of cached files is displayed. 2. Press Back to check the status of the UFO extension. 3. Press Show more details to view the list of cached files. Note: The Show more details option is displayed only when you have at least one cached file available. 1. In Google Drive press the Open file button next to the file name. The file is downloaded and opens locally in its software application. An information pop-up is displayed. If the file is too big or takes too long to open, you can cancel from the pop-up. Alternatively, if you're using the AODocs Smartbar, you can open your file in the Google file preview and select Open file in the Smartbar menu. Learn more: Access Smartbar features in the Google Drive file preview. - If you aren't allowed to copy, print or download the file, you can't download it and open it locally with UFO. An error message is displayed. - The download may take a while, depending on the file size. - If you want to open a file that was last edited by yourself with UFO, the UFO extension doesn't download the file again but opens the file stored locally. - To open a file in a specific software application, the application itself must be installed on your computer. - If several local applications can open the file, UFO chooses the default application defined on your computer to open the file. 2. Edit your document locally on your computer. Note: If you have read only access to the file in Google Drive or AODocs, you can open the file, but any changes made and saved locally will not be uploaded back to Google Drive or AODocs. 3. Save your changes locally. A message indicates that the file is being uploaded back to Google Drive or AODocs. It's saved as a new version with all the updates you made locally. You can cancel the upload if required. What is the Universal File Opener (UFO)?